So much opportunity for marketers to help their companies drive growth sits outside home base. Just optimizing marketing tactics isn’t enough anymore to take full advantage of that opportunity. Today’s marketers need to optimize their ability to create and deploy world-ready marketing. 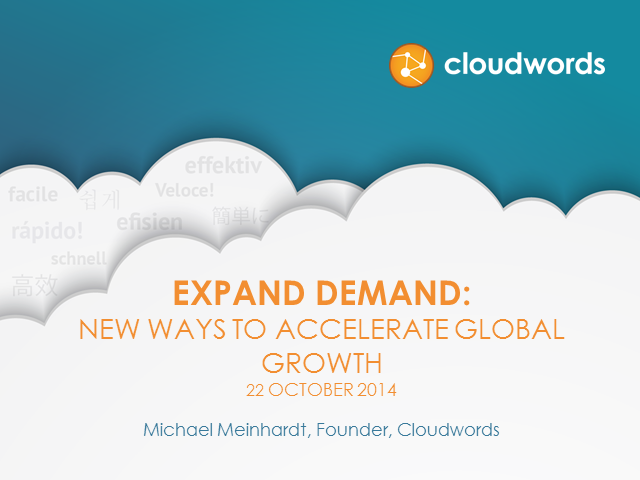 In this webinar, globalization guru Michael Meinhardt shows you ways to do so, that you may never have thought about before! Driving engagement and loyalty with customers around the world is more complex than ever. One thing is simple, though: speaking a customer's language is the most fundamental element of personalized -- and therefore effective -- communication. Since it's more urgent than ever to get great at delivering all the right content, to all your audiences, in all the languages they speak, how do you do it right? This webinar will provide a primer on how global marketers today can localize to personalize more easily than previously possible. Join us for this live webinar on “How to Easily Orchestrate Global Marketing Campaigns” with global marketing experts at Cloudwords on July 30th, 2014, at 10am PT / 1pm ET. If you are global marketer, this is a rare opportunity to get fresh insights on ​how to solve ​a growing challenge. Join us for this live webinar “How the Global Buyers Journey is Changing” featuring SiriusDecision Research Director Gil Canare on July 9th, 2014, at 10am PT / 1pm ET. If you are global marketer, don’t miss this live webinar and register now to get ready to tackle new global markets tomorrow. Join us for this live dialogue featuring marketing globalization experts from PowerIntegrations and Cloudwords to discuss new best practices in global demand generation. You will also get to chance to learn about Cloudwords for Eloqua, the first Marketing Globalization Platform for Eloqua enabling its users to accelerate the localization of marketing campaigns with one click. Global marketing pro, Heidi Lorenzen, shares five can't-fails of delivering marketing content on a global scale, and how these best practices make a world of difference in time-to-market, customer engagement, and company growth.